The penultimate home game of Tottenham’s 2013-14 Premier League season will be an early Saturday kick-off against Fulham. The visitors’ season has been absolutely disastrous but despite spending the majority of the campaign in the relegation zone and a state constant turmoil, it looks like a miraculous escape could well be on for Felix Magath’s men. If Fulham do stay up it will be mostly due to Norwich’s utterly disgraceful inability to score goals, but the Cottagers’ new German-Puerto Rican manager will admittedly have to be given some credit for steadying what was a spectacularly sinking ship. Magath has made the team more organised and resilient, reinstating the traits that Roy Hodgson instilled in his own Fulham side when they achieved a great escape in 2007-08. Considering how strong Hodgson side’s collective identity was, it is remarkable how totally Martin Jol ruined the team when he took over. While the squad was admittedly old and certainly lacking in stamina compared to its rivals, his addition of flair, flair and more flair at the expense of everything else made the team a total hodge-podge of styles that never truly meshed. Under Magath, Fulham have a more defined purpose and a stronger sense of unity. The same team that conceded for fun under Jol and Rene Meulensteen has become more organised and solid. Two clean sheets in their last three home matches have come at the end of a run of three clean sheets in twenty-nine games home and away. Indeed, the biggest problem under Jol and Meulensteen was that their sides were so open and easy to play against. The statistics speak for themselves: Fulham still lead the Premier League when it comes to the average number of shots conceded per game with 18.1, a truly ridiculous figure. In recent games the figure has dropped to nearer 14 – still bad, but an obvious improvement. Fulham’s notably low figures of 18.3 tackles per game, 13.3 interceptions and 10.1 fouls further illustrate how easy they have been to play against. While they have repeatedly found themselves cast as the more reactive team in matches, they have done very little to make life difficult for their opponents and have paid for their idleness with a number of embarrassing defeats. They have been particularly bad away from home, taking a seasonal average of eight shots per game while allowing 21. Little wonder then that they have conceded 40 goals in 17 away games, the most in the division, accumulating a total of 11 defeats on the way. This suggests that Tottenham should win comfortably on Saturday lunchtime but as last week’s game at the Hawthorns showed, this time of season is when those at the bottom start to play to their potential. Fulham are a textbook example of this. Consecutive wins over fellow strugglers Aston Villa and Norwich have given the Cottagers a fighting chance of survival and, as with West Brom last week, Tottenham’s opponents come into the game with the theoretical gulf in quality between the sides bridged by pure motivation. 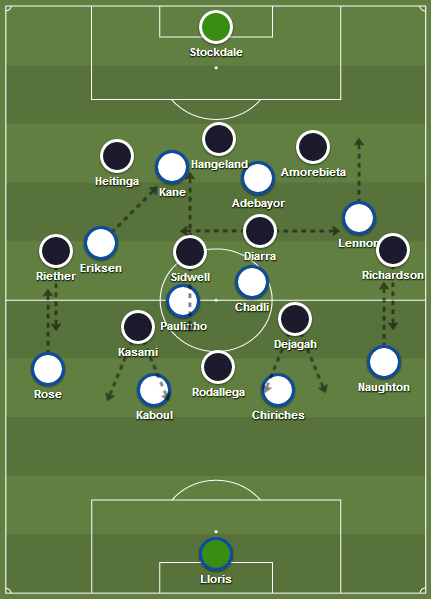 In their last few games Fulham have changed formation and system several times, but they seem set to have settled on a 3-4-2-1 not dissimilar to that used by Walter Mazzarri’s famously hipster-bait Napoli side. Three centre-backs sit deep and close off all space in the penalty box, while two central midfielders protect them. Energetic wing-backs get up and down the pitch and carry the ball forward at transitions, while two more creative attackers drift around freely in support of an out-and-out number nine. As far as Saturday’s probable line up goes, David Stockdale has somehow displaced Maarten Stekelenburg between the sticks and will presumably keep his place due to a run of good form and familiarity with the defenders in front of him. Centre-backs Johnny Heitinga, Brede Hangeland and Fernando Amorebieta will sit in front of Stockdale, primarily defending the penalty box in a no-nonsense style and hoping that quantity masks their lack of quality. Last season’s club player of the year Sascha Riether will bomb up and down the right flank while Kieran Richardson will do the same on the left. Steve Sidwell and Mahamadou Diarra will use their considerable experience to close up the middle of the park. Sidwell plays a more box-to-box style and is Fulham’s top scorer this season with six goals, while Diarra will play more of a smart positional game and look to knit everything together. While recent injuries may have taken the edge off of his game, the Malian remains a formidable opponent. With Lewis Holtby unable to face his parent club, Pajtim Kasami and Ashkan Dejagah will support Hugo Rodallega up front. All three have flattered to deceive at Craven Cottage, often displaying considerable talent but rarely contributing in any real sense. Kasami may well win goal of the season for his October effort against Crystal Palace but it is hard to think of anything else he has done, while Dejagah’s mercurial talent was probably misused by Jol and Meulensteen. As for Rodallega, his recent goals against Aston Villa and Norwich mean that he has now scored as many goals in his last 95 minutes of football as he had in the two years before them. If Tim Sherwood paid any attention to tactics he would know that Fulham’s system is set up perfectly to play against his knowingly naïve up-and-at-them 4-4-2. Two of the three centre-backs man-mark the strikers while the other sweeps; the central midfielders have security in numbers behind them and so can afford to play an unambitious positional game; the wing-backs join the fluid and mobile attack to overload the home defence on the counter-attack. The way to score against a back three is by using width to attack and drawing it from side to side by switching the play. It would make more sense to play Christian Eriksen alongside Emmanuel Adebayor instead of Harry Kane and play an out-and-out winger on the left like Andros Townsend. With Eriksen, Paulinho and Chadli able to roam and switch the ball from flank to flank, space will open up in the middle and the way to goal will clear. However, such logical thought appears to be beyond Tottenham’s soon-to-depart gilet-throwing simpleton, so expect an unchanged lineup and a ride as bumpy as last weekend’s. Spurs’ greater individual quality really should tell at home to a side that has struggled, but Magath’s powers of motivation and organisation could yet throw a spanner in the works.